Janine, animal healer in the Netherlands, tells about her wonderful results with animals: www.mirmethod.com/testimonials/animals/ For example: peeing in the house, bad fur with fur loss, fights between cats, epileptic attacks, fear of abandonment, wounding/ scratching, etc. We would love to receive more testimonials. We realise that writing them down on the website takes some effort, but please realise you may inspire thousands of other people to give the MIR-Method a try! Thank you! We are happy to announce that Mireille will be giving a new English Webinar on Saturday 22nd of September 2012, starting 22.00 (Central European Time). 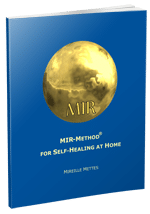 In this Webinar she will explain in more detail about how the MIR-Method works. She will give examples of what people have reported as results and you will learn more about the different ways to use the MIR-Method, for example with children, animals or with conditions like addictions or skin disorders. It is also possible to ask personal questions. If you can’t watch the webinar ‘live’, you can always register and look back at the recording that everyone receives after the Webinar. We are very happy to announce that the Handbook of the MIR-Method has been translated by Pablo Simeone from Argentina into Spanish. This is wonderful news, because now the information of the book can also spread to all Spanish-speaking people around the world. Thank you again deeply, Pablo! You can find the Spanish e-book in our web shop. I would like to thank you for sharing this beautiful process, it is becoming a close friend and trusted advisor. There are times when my mind might thing one thing, but as I practice the protocol I get a better understanding of where the reset is needed. Since class I have worked with animals, family, and friends. Most notably helping a friend learn to balance her adrenals and most recently helping a family as a loved one passed. In the later case steps 5 and 7 to the rescue. Before MIR I would remind one to breathe, with MIR we get to support at the strong intuitive level as well and support from within. Many thanks, many journies yet to share. I have translated the 9 steps into Latvian! Please let me know if you would like me to send them to you. Thank you so much for translating them into Latvian! I will send you an email, so you can send them over. Thank you on behalf of all Latvian people! I was greatly impressed by your method and when I watch the video and listen to you I felt love to you because of your wish to help others. I told some of my friends about your method and began to practice it from the day I saw your video. It was September the first. At present I’ve notice that my inability to stop eating came to the end. Every time when I took food I couldn’t stop the process even when I felt that have enough. Now this bad habit came to the end. And it’s very good! I like such a change. At present it’s all I can say about influence of MIR. I’ll report you if I notice other changes, of course. Thank you for your wonderful testimonial! I am very happy for you! Usually all the 9 steps work together and in the case of not being able to stop eating it is usually balanced by especially steps 3 and 6. Well done! Thank you for inspiring others by telling your story!